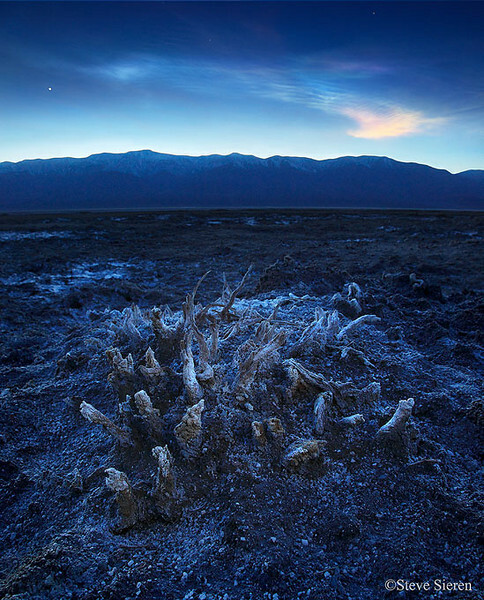 Twenty thousand years ago Death Valley was submerged by a lake 600ft deep. Could you imagine a place such as Badwater to be actually green at one time in the past? Life did exist here and that is the feeling I wanted to capture in this image. The unique clouds in the sky and hovering planet float above the basin like a spirits in the sky. When something is seen in the skies that is unusual or uncommon, it’s easy to just say that is not real or it’s trick. The photographer might be trying to fool us, “we’ll have to keep an eye him and catch him sometime.” I can’t blame anyone for thinking that way, I’ve seen some odd things and have thought the same thing myself. The only way I can find a way to relate this to anyone is if you have actually stood in the Owens Valley long after the sunset glow has dissappeared and seen the oddly shaped lenticular clouds catch their light so long after every other cloud has lost it’s color. If you have seen this you know the clouds must be so high up in the atmosphere for this to occur. At the time of this capture I was a hundred miles east of the Owens Valley so I’m seeing the backside of one of these so called UFO’s. We all know the most famous guy for photographing these lenticular clouds so I don’t need to mention his name but he does have a nice example on page 5 of his Eastern Sierra gallery in color. There is a little bit of unnaturalness happening here, I did use my i-phone to light up the dead stems during the long exposure. That isn’t much light so I don’t know if we could call it light painting. As for that planet there in the sky, I’m not an astronomer and I do not know which one it is but I did take this a few days earlier this week. If you have any questions on how this was photo was created or think it’s not real either way I would love to hear it. If you are into night photography or it’s not your cup of tea please feel free to voice your thoughts and opinions. One last thing there is life on the badwater basin, it’s a microscopic bug called an extremophile, it thrives in the 120 degree heat of summer and it’s name suites it well. What kind of slang could we call them, fire lice maybe? hmmm.. . This entry was posted on February 5, 2010 at 12:31 pm and is filed under Uncategorized. You can follow any responses to this entry through the RSS 2.0 feed. You can leave a response, or trackback from your own site. Galen Rowell? I feel like it’s a quiz! LOVE your writings. Heather, yes you are right! Thanks, I like to think I’m getting better as I go. I’m begging to know where the phrase talk show on mute comes from.